Submitted by Alberni Deep Space on January 12, 2019. Thanks to all who made Port Alberni’s annual Peace Walk one of the ways you welcomed 2019. Last year, 2018 saw major leaps forward in space science, from probes on Mars to the Ultima Thule probe that made history on December 31, when it reached one of the most distant bodies of our Solar System. Earlier, on December 3, Canadian astronaut David St. Jacques boarded the International Space Station as one of just 3 humans aboard for Christmas 2018, circling Earth as we sit here. Like every astronaut and cosmonaut who has seen the jewel of Earth from space, St. Jacques noted that Earth actually has NO political borders, NO colour-coded patches setting certain regions apart from each other. We really, truly are all one people, under one sky. To borrow Carl Sagan’s words, “every human being who has ever lived” was born on this pale blue dot, our home planet, Earth. You would think that by now we would have learned basic housekeeping and budgeting. But the view from the ground shows we have a lot to take responsibility for. 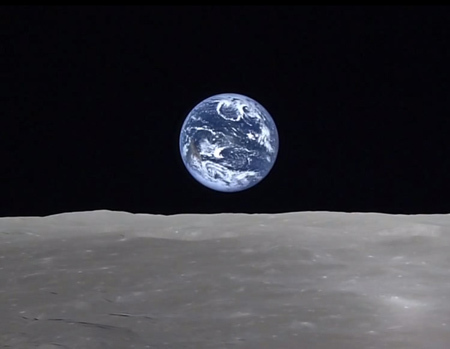 Earth from space looks more peaceful than the way most Earthlings experience it. We have found so many ways attack each other. While the richest countries slam their borders closed to refugees, the middle and emerging nations care as best they can for 85% of the world’s refugees: 1 million in Lebanon, 1.4 million in Uganda, 1.4 million in Pakistan, 3.5 million in Turkey. Iran hosts almost another million, and Kenya over 600,000, and the list goes on Globally, there are over 68.5 million people forcibly displaced. 10 million are the ultimate homeless – they are stateless. Every day, another 44,400 more people are forced to flee their homes. (Those are United Nations statistics for 2018.) So the fuss made by rich countries over refugees arriving in the thousands or even tens of thousands seems pallid by comparison. More frightening is how we have turned against the only place humans have ever lived: Earth. For some two centuries, humans have been at war with our own planet. The United Nations International Panel on Climate Change has been ringing alarm bells for more than a generation, with little effect. David Suzuki has done the same for even longer. They are become as voices sounding in a desert. The storms of December in BC and elsewhere in Canada are, to borrow from HG Wells – the shape of things to come. In October 2018, the United Nations finally decided to stop being polite and start being direct. We had (then) 4 – 12 years to make peace with Earth itself. We now have – at best estimate – just 11 years, before key elements of Earth’s planetary systems reach tipping points that we will not be able to reverse. But the global attack on forests continues, as we humans clear land by burning the very trees that produce the oxygen we breathe. We continue using oceans as toilets; and feeding 10 kg of high-grade plant protein and 1100 litres of chemically purified water to produce 500 grams of beef that only the rich can afford, while we bury agricultural land under pavement. In the 1980’s the Western Canada Wilderness Committee produced a button that said, “Stop the War Against Nature.” Yet we still seem to be rolling straight over another cliff. Is it time for the Wilderness Committee to bring the badge back for an encore? There’s a medieval French tune that I often play when busking for the Salvation Army every December. It’s called Masters in the Hall, and harks back to times when feudal Masters held forth in the Great Halls of their castles. We, the people, are Masters in this Hall of nature. If politicians and corporations won’t put down their weapons to give Earth a chance, it’s high time we did. For 2019, learn to garden, explore a plant-based diet, refuse-reduce-reuse-recycle, help a refugee, walk more-drive less, install more LED bulbs, plant three trees, and look for a little book called “50 Simple Things You Can Do to Save the Earth” from Earthworks Press (1991). Be the Master in your own Hall, stop the war against nature. Declare your personal peace with Planet Earth – and do something about it. I go through the things which happen according to nature until I shall fall and rest, breathing out my breath into that element out of which I daily draw it, and falling upon the earth out of which my father collected the seed, and my mother the blood, and my nurse the milk; out of which during so many years I have been supplied with food and drink; which bears me when I tread on it and abuse it for so many purposes. One can’t learn much, and also be comfortable. One can’t learn much, and let anyone else be comfortable. Thanks for reading, thanks for caring. Starting April 22, a STARFLEET team will beam down to Port Alberni armed with loppers and saws in place of their trusty phasers, launching their 2017 campaign against Scotch broom. The STARFLEET group challenges clubs, businesses, school classes, families and individuals to boldly go and adopt a patch of land to keep it broom-free. Broom needs to be cut while in bloom, before seed pods form. Brooming season has been sneaking up on us as climate changes. STARFLEET group president Gillian Shearwater recalls broom peaking in mid-June. However, in the past few years, it has been fully seeded by the end of May. The Trek fans now begin cutting in the last ten days of April, every weekend for four weekends, racing to beat seed formation. Green pods ripen after cutting, scattering some 18,000 seeds per plant. To learn about cutting broom safely and effectively, the website at Broombusters.org offers an excellent video tutorial. Everyone is asked to post their broom cuts to the website to inspire others. Essential safety gear includes eye protection, gloves, long sleeves and pants, closed-toe lace-on boots, and sun protection. Knee pads are highly recommended. Adopted patches can be a small as your own property or apartment grounds. They can be group projects on public land where you need to coordinate with local or provincial government. The City of Port Alberni can also recommend Adopt-a-Patch projects. Broomers need to get permission from landowners or the appropriate level of government, and arrange for proper disposal before cutting. This is down-and-dirty hand work, because each stem has to be cut at or below ground level for the cut to be effective. Tools of the trade are long-handled loppers, with sturdy pruning saws for thicker stems. Pulling up the plants just gives dormant seeds a better chance to sprout. The disturbed soil opens up, the seeds fall into darkness, and moisture triggers their growth. Weed eaters will not cut flush or below ground level. Instead, they leave sharp stumps hiding in the grass to gore the legs of other broom teams. Want to see the difference? Visit the SPCA grounds on Broughton, where STARFLEET Alberni Deep Space Port members have removed more than four dumptruck loads of broom over the past two years. For one member, it's freeing tree saplings strangled by broom. Another, the group's resident Vulcan, finds it "logical" to eliminate broom. For the entire team, it's the satisfaction in seeing the difference their own efforts have made. Broom chokes out native vegetation and creates an extreme fire hazard we can't afford in our forest community, especially in summer. Alkaloids and other toxins make the plant harmful to animals and curious children. Bacteria on the roots alter the soil, allowing other invasive species to thrive. Every cut makes a difference. Scotch broom already infests much of Vancouver Island. It has spread as far as Haida Gwaii, north to Terrace, and south into the United States way beyond California. It all began with a handful of seeds planted on a farm in Sooke back in 1850. One patch at a time, broom can be defeated. Resistance is not futile, it's essential! STARFLEET members ask, will you help make it so? For information about broom and broom busting on Vancouver Island, visit www.broombusters.org.